Cell therapy has been examined for clinical applications as treatment for osteochondral defect. This time, we reported that combined use of the mesenchymal stromal cell injection and ultrasound stimulation promoted the articular cartilage and subchondral bone repair. We suggested that ultrasound is one of promising physical therapy modalities for the treatment of the osteochondral defect in regenerative medicine. 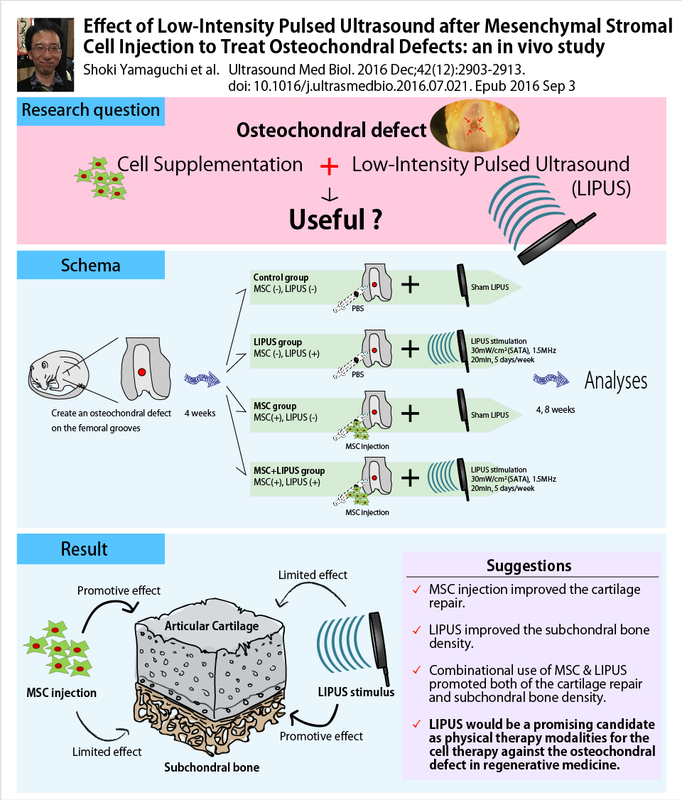 Citation: Yamaguchi S, Aoyama T, Ito A, Nagai M, Iijima H, Tajino J, Zhang X, Wataru K, Kuroki H. Effect of Low-Intensity Pulsed Ultrasound after Mesenchymal Stromal Cell Injection to Treat Osteochondral Defects: An In Vivo Study. Ultrasound Med Biol. 2016 Dec;42(12):2903-2913. doi: 10.1016/j.ultrasmedbio.2016.07.021.